Alright so tried the new modernframe. Definitely works, however, startup time was affected significantly. I was greeted with a black screen until I hit Ctrl+Alt+Del and hit taskmgr. I'm sure that was coincidence but I was watching a black screen for about 2 minutes on an 850 Evo SSD. I disabled it for now and next reboot was back to normal time. I install new version too, but system loads as usual. I'm using OCZ Vertex SSD. Windows x64 Pro 14393.321. Yeah, since ModernFrame does not load at startup at all but only when explorer.exe or applicationframehost.exe is executed, and it does not even affect rendering in any way, than any black screen cannot be caused but this DLL. Yeah I dont know what to tell ya man. Start up was fine before I loaded the ModernFrame and it was fine again after I unloaded it. Ive restarted multiple times in the past few days and the only time it took longer to start than usual is when the ModernFrame was loaded. When I use Aero Glass without the ModernFrame, then startup is also normal. Is what it is. Can dispute it all you want but I know my machine that I built myself and I know when something isn't right. Sorry to hear that--maybe some other aspect affecting it. About the same startup time here. Good luck! Eh its all good. It'll either be fixed or it won't. I don't *need* this tool in order to enjoy using my computer. It just adds a bit more customization. While MS made it inconsistent to put blur/transparency on everything else but Windows, I've gotten used to it and with OldNewExplorer removing the ribbon and giving me more color in the titlebars, I'm pretty happy. This is just an awesome thing to have and will keep trying newer versions as they come out. registry path and paste there. We will try to help. Yes I've used the ModernFrame before so I know how the AppInit DLLs work. I was using that back when AG had to be loaded that way. Trust me, I make a living fixing peoples' computer problems. I didn't make it to a Level 2 by being a novice. AppInit_DLLs has C:\AeroGlass\ModernFrame.dll (Yes, I renamed his release version to just ModernFrame.dll) and LoadAppInit_DLLs was set to 1. It's not anymore since I've turned it off until it's fixed. Thanks for the offer, but I know this isnt my issue. 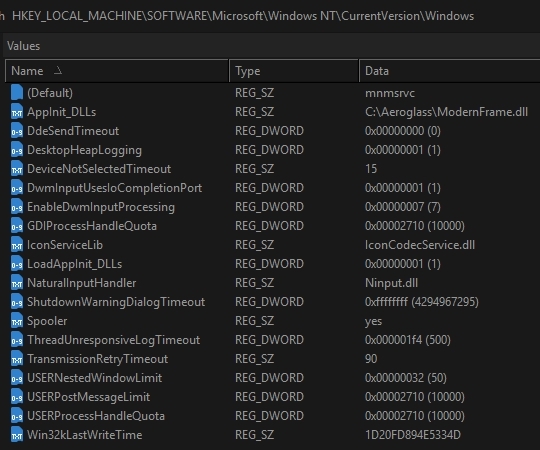 And check is "RequireSignedAppInit_DLLs"=dword:00000000 key present in HKEY_LOCAL_MACHINE\SOFTWARE\Microsoft\Windows NT\CurrentVersion\Windows, if so delete this key. From Anniversary Update this key not needed and it makes troubles or issuies. How could I see, it's works or not? What does this dll? I put the dll to c:\aeroglass dir, did the mods in registry, but after restart the system, I cann't see any difference. 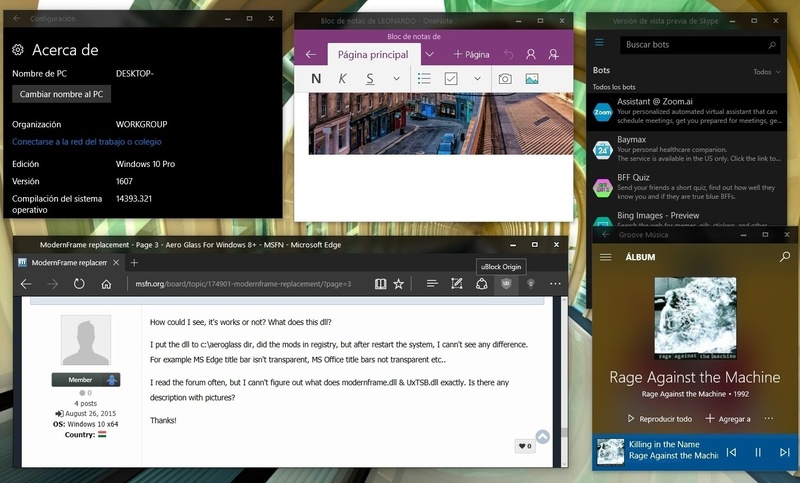 For example MS Edge title bar isn't transparent, MS Office title bars not transparent etc.. I read the forum often, but I cann't figure out what does modernframe.dll & UxTSB.dll exactly. Is there any description with pictures? Now I know what is it, but unfortunately it's not works on my system.. Here is my registry, can you see any problems? And I use UltraUXThemePatcher & OldNewExplorer, maybe these cause the problem with ModernFrame.dll? You must disable SecureBoot else it won't inject. Yes, SecureBoot is Enabled on my system, but not too safety to Disable this function.. This is the only one possibility, to activate ModernFrame.dll? Currently yes. ModernFrame is only experimental hack so it requires non-standard steps. On the other side, SecureBoot does not really increase security in any way, it gives only false safety. OK, thanks for the answers! I thought that, SecureBoot is a good solution against unsigned keyloggers and bootviruses. Yes, I tried: it is works with disabled SecureBoot!